« McGaijin Software interview – Learn Hiragana Now! In the past year I’ve stayed at two different Prince Hotels in Tokyo. The Shinagawa Prince Hotel, and the Shinjuku Prince Hotel. 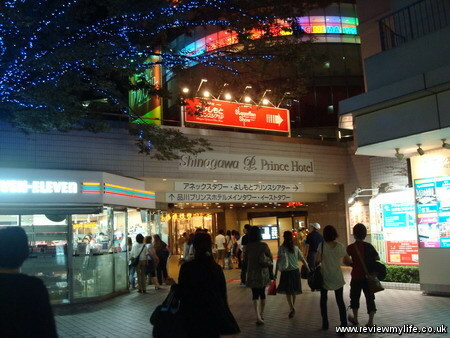 The Shinagawa Prince Hotel is right across the road from Shinagawa Station. A number of lines are accessible from here including the Yamanote Line which loops around central Tokyo stopping at many of the major stops. There isn’t much else of significance in the area, so if you stay at this hotel you will have to take the train to wherever you want to go. 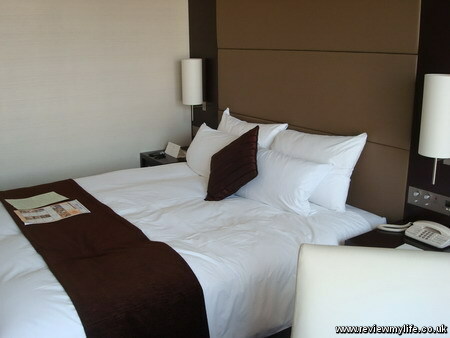 The hotel is part of a large complex containing several towers, an aquarium, cinema, restaurants and shops. I was staying in the main tower, and had booked a room on a ‘high floor’. That was defined by Expedia as being on the 28th floor and above. The reception was very smart, and large. It needs to be to handle the thousands of guests who can stay here. The check-in was smooth and we were allocated a room on the 35th floor. There are express lifts for different floor levels so that it doesn’t take long to reach your room. Here’s the part of the room with a large bed, table and chair. Also note the size of the window. It goes from near the floor to the ceiling. Here is the bed from the other side. Very comfortable by the way! Both this Prince Hotel, and the Shinjuku Prince Hotel had a system (green linen service) whereby if you opted not to have your sheets and towels changed every day they’d give you vouchers to spend in the hotel shop. You just need to fill in a form, and tell reception. Remember the window? Here is the view from it. This is looking North East from the main tower. The Tokyo Tower is visible on the left hand side of the photo. One of the best things about these Prince Hotels is the large window, and view it gives. It is definitely worth getting a room on a high floor. 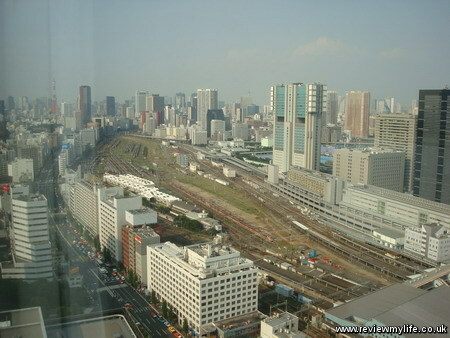 On the above photo you can see the busy Shinagawa Station. It has loads of different tracks leading to it, and there are trains constantly going in and out of the station. 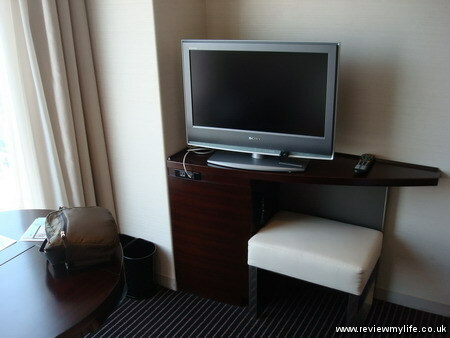 Back to the inside, here is the TV which is by the window. 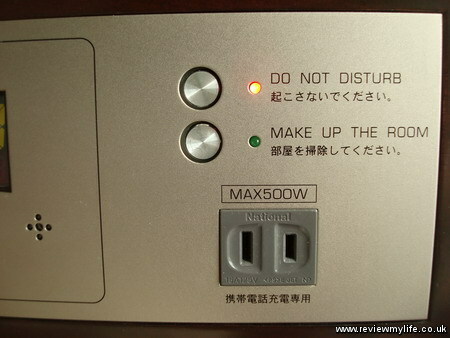 Instead of having a traditional ‘Do Not Disturb’ sign the Shinagawa Prince hotel had a ‘Do Not Disturb’ button. A nice touch and something that I wish the Toyoko Inn hotel chain would do. 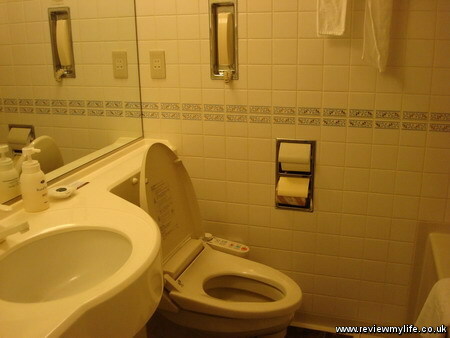 This is the bathroom, it is fairly standard for hotels in Japan. The fittings looked quite new and the shower pressure was good. Here’s the view from the window at night. Loads of tall towers with their twinkling red lights are visible across Tokyo. 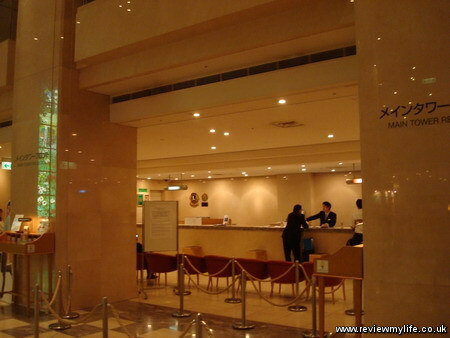 On the left is a photo of the main tower, our room was near the top :) And on the right is the entrance to the hotel. In the hotel complex are Japanese and Italian restaurants, as well as clothes shops and a convenience store right on the doorstep of your room. The restaurants aren’t the cheapest in Tokyo, but if you want a bigger selection you’ll have to travel, as there aren’t many other restaurants in this area. The Shinjuku Prince Hotel is a 6 to 7 minute walk from Shinjuku station and is right opposite the Kabukicho nightlife area. 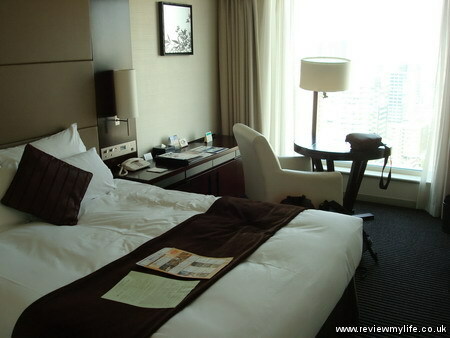 Like the Prince Hotel at Shinagawa the inside is very smart, and the rooms have a giant window. The main difference between the two is the view you get. Again we paid for a room on a high floor which for this hotel meant a 20th floor room (this hotel isn’t as tall as the other one). 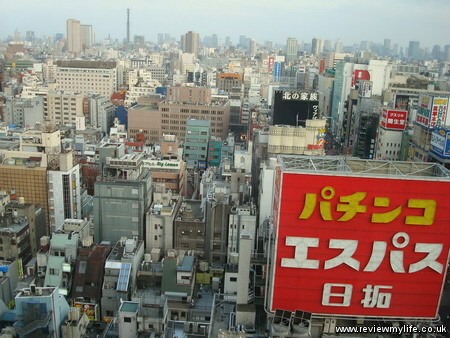 The above photo is looking East towards Kabukicho, and the one below is looking South East over Shinjuku. Here is a final photo of the view at night. 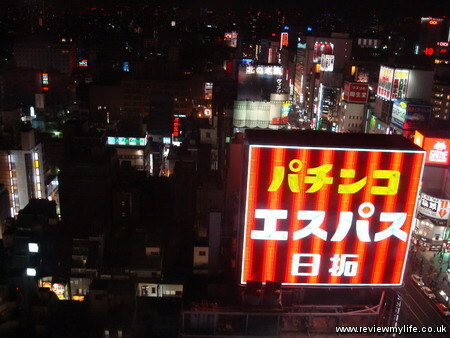 The giant red sign is for a pachinko parlour which was across the street. Both hotels put a free copy of the Daily Yomiuri (English language Japanese news) paper outside our room each day. And both hotels had very expensive breakfasts available. But fortunately each of them had an empty fridge in the room, perfect if you want to buy some milk and cereal for breakfast. You won’t find a coin laundry in either hotel which is a bit of a pain, as the nearest coin laundry to each is about 20 minutes walk away. 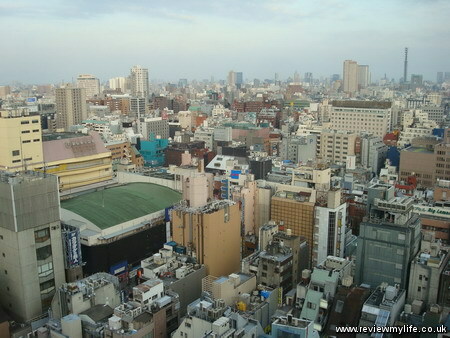 Both hotels are great if you want a comfortable room with a Tokyo view. Both are also very convenient for access to the Yamanote Subway line. I’d recommend paying extra for the high floor – make sure you get the high floor before booking if that is what you want. This entry was posted on Monday, October 4th, 2010 at 3:36 pm and is filed under Japan. You can follow any responses to this entry through the RSS 2.0 feed. You can leave a response, or trackback from your own site.